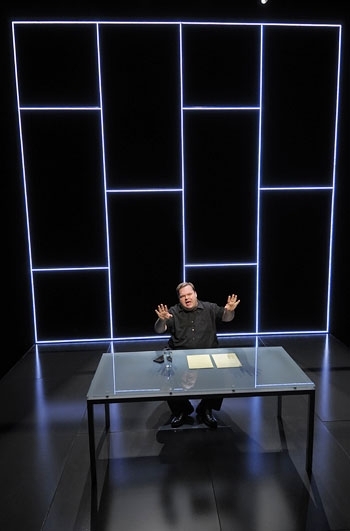 The Agony and the Ecstasy of Steve Jobs" is Mike Daisey's second monologue at the Berkeley Repertory Theatre in as many weeks. Daisey's latest could be described as wildly enjoyable if its message weren't as sobering. This production has a much tighter focus than Daisey's last piece at the Rep, "The Last Cargo Cult." While the latter ripped consumerism as a whole, the former aims its ire at a particular target: the titular Steve Jobs and his Apple corporation. Whereas "Cargo Cult" successfully linked American identity to commerce, Daisey uses the metaphor of religion in "Agony and the Ecstasy" to examine the role of personal computing technology in contemporary life. As Daisey notes, we sleep, wake up and die by our phones (check-out Highway 13 every night around 5 p.m. for proof). More and more we are controlled by our iPods, iPhones and iPads, he argues, as we become slaves to our machines. "Agony and the Ecstasy" asks: If we are going to live in a cult of Apple technology, shouldn't we at least know its origin story? The monologue recounts two connected but radically different parables of Apple. First there is the Life of Job-or rather Life of Jobs-wherein Daisey recounts the rise of the Apple CEO from bare-footed college dropout to bare-footed consumer electronics wizard. Daisey speaks of Jobs more like a mystic than an ordinary businessman. With hushed tones, he recounts shrewd deals, bolds visions and the man's exile from-and return to-Apple. These aspects of the show are sometimes illuminating, sometimes terrifying; Jobs' brilliant but vicious business practices are a source of pity and laughter. Woven into "Agony and the Ecstasy" is Daisey's telling of his own trip to Shenzhen, one of China's special economic zones, where almost all of the world's electronics are manufactured. This vision feels more like the Book of Revelation than the Gospel. Daisey describes a massive factory "employing" half a million people a day in order to sate the world's thirst for tiny, well-designed mp3 players. The scare quotations are there, because as the factory is described, it sounds more like a labor camp than a job. In these moments Daisey paints an agonizing and unacceptable creation story for our revered iPhones. It would be easy to tag Daisey as a holier-than-thou activist. Yet he freely admits a long-held passion for computer technology, especially Apple products. Daisey isn't just performing a monologue, he also enacts the struggle first-world consumers take part in everyday whether they realize it or not: Is my desire for stuff hurting the lives of others? He is not a zealot, he does not advocate throwing oneself on the gears of the machine. Rather he seeks to raise consumer awareness of the human cost, not just the $400 price tag. Besides the slightly different concerns, Daisey's delivery is keener since his last show. His voice is softer at times and the f-bomb count has dwindled. Yet he still pulls himself and the audience towards the edge of hysteria repeatedly. His narrative voice has found some sort of middle ground between the Howard Beale-ness of Lewis Black and the geek-age of Patton Oswalt (can't imagine what that baby would look like: a screaming tirade on Marvel vs. DC Comics). "The Agony and the Ecstasy of Steve Jobs" presents a chance to come to Jesus and witness the power and glory of modern theater.